History was made tonight as World Cagefighting Championships brings WCC 17 to the Clipper Magazine Stadium in Lancaster, Pennsylvania. 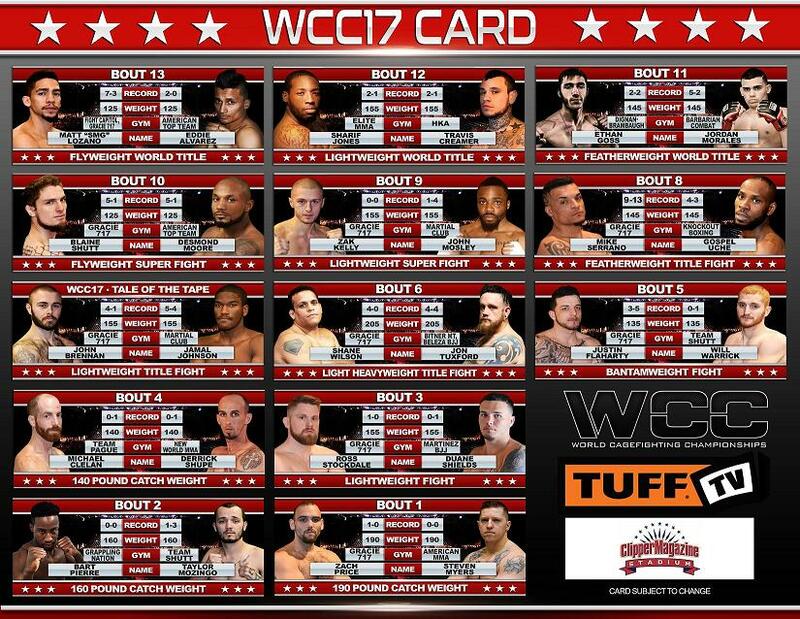 WCC 17 promised to be the biggest mixed martial arts event held within the Keystone State outside of the UFC and it delivered. The extremely uncomfortable heat index was a cause for concern and thus the Pennsylvania State Athletic Commission changed the bout order and decreased round time in an effort to increase fighter safety. A total of 13 fights streamed live on Tuff.tv pay-per-view beginning. In the evening’s scheduled main event, Matt “SMG” Lozano took on rising star, Eddie Alvarez. Lozano, a Legacy FC, Bellator, and WSOF Veteran is right on track to land a contract in the UFC’s 125-pound division, and a win over Alvarez could warrant a call from matchmaker Joe Silva. The scheduled co-main event featured a grudge rematch between Sharif Jones and Travis Creamer. The first fight back in March saw Creamer declared as the winner albeit a controversial stoppage that warranted a second fight. Tonight’s fight was for the organization’s lightweight professional title and Jones would get his revenge and he forced Creamer to submit in the third round. In a great show of sportsmanship the two fighters embraced in the center of the cage after the contest. Also, featherweights Ethan Goss and Jordan Morales competed for the WCC title in the professional rankings, while Mike Serrano and Gospel Uche had their third fight to settle the score and declare the organization’s amateur featherweight champ. The entire card top to bottom was packed with intriguing matchups, such as a flyweight superfight between Blaine Shutt and Desmond Moore, both 5-1 as pros. Shane Wilson successfully defended his amateur lightweight title against Jon Tuxford in what was Wilson’s toughest fight to date.